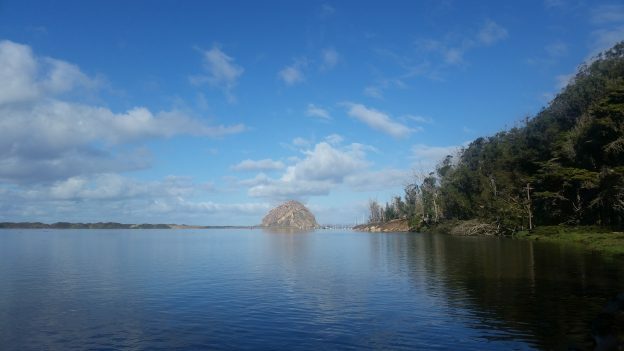 Protecting and Restoring the Morro Bay Estuary. From the Director’s Desk is a twice-yearly blog series, written by Executive Director Lexie Bell. Lexie plans and directs the program’s work, and collaborates with the Estuary Program’s many partners to expand our collective success in the watershed. 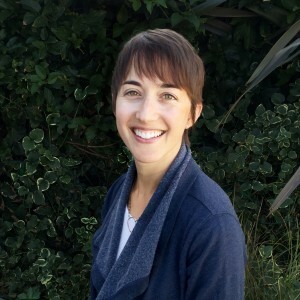 Lexie first began working in Morro Bay as a graduate student at the UC Santa Barbara Bren School of Environmental Science and Management. Her graduate work analyzed the economic impact of visitors’ perceptions of environmental quality in Morro Bay. In addition to her Master’s degree, Lexie graduated from the University of Miami with a Bachelor of Science in Marine Science and Biology. Previously, Lexie worked for the National Oceanic and Atmospheric Administration’s Office of Education, the Nature Conservancy, and the Central Caribbean Marine Institute. A native of Florida, Lexie now lives with her family in Los Osos and enjoys our beautiful Central Coast beaches at every opportunity. Every day, the staff at the Estuary Program advance the protection and restoration of our bay. We teach students how their lives mix with the waters of the estuary. We use scientific inquiry and creative thinking to learn how the bay flows and supports life. We move earth and plant new habitats to improve the condition of our bay. We join forces with partners, neighbors, and our community to get things done. Our volunteer crew for Coastal Cleanup Day 2017 included community members, staff from partner organizations, and local college students. Photograph courtesy of Michael “Mike” L. Baird. Even during our busiest days, our earliest field calls, and our most engaging events, we are connected to those that came before us on this path to protect and restore the bay. The Estuary Program would not exist without the love and dedication of our community. Local filmmaker Simo Nylander captured this story of neighbors coming together to protect this beautiful and important bay in his recent award-winning documentary Of Marshes and Morros. Revisiting our past through this film allowed us to look toward the future with fresh perspective. How will we continue to honor the commitment of this dedicated community as we grapple with new challenges and changing science? I believe the key is to keep our connections strong and remember that the passionate people who care for Morro Bay are our biggest assets in the drive to protect and restore it. Volunteers helped our Restoration staff out with rides to transplant sites, and even stayed on to help put eelgrass shoots in the ground. 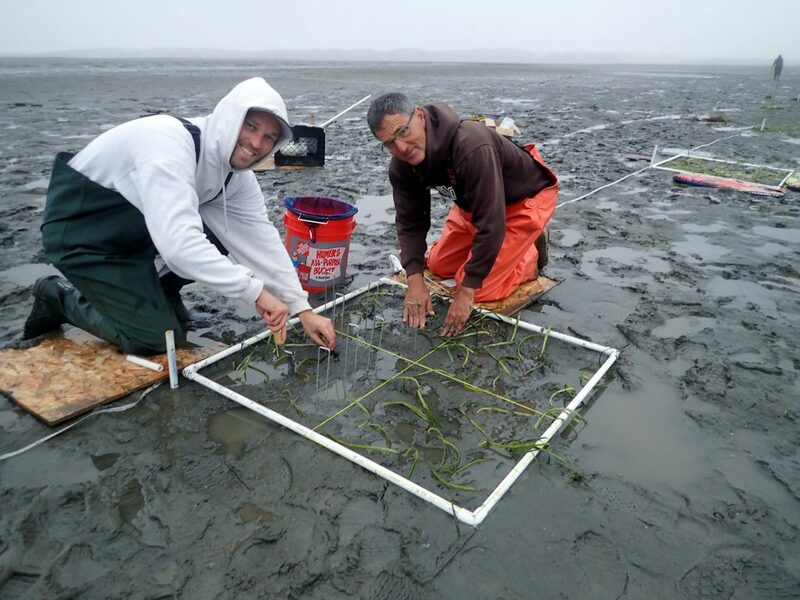 In the picture above, Nick of Terre Verde Environmental Consulting (left) and George, Owner of Grassy Bar Oyster Company, help stake down new shoots. Thank you, volunteers! In 2017, Estuary Program volunteers contributed nearly 2,000 hours to monitor water quality, educate our community, and support bay friendly practices. Without our volunteers, we wouldn’t know about bacteria levels in the back bay or water clarity in our creeks. Without our volunteers, we wouldn’t be able to provide more than 300,000 pet waste bags to keep bacteria from entering the bay. 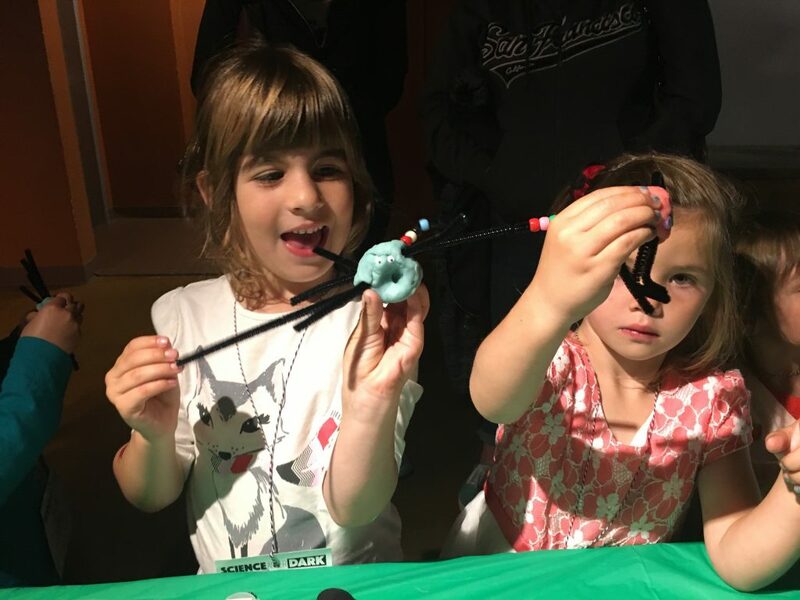 Kids learned about the bugs that live in our local creeks and then made their own at the Estuary Program’s booth at this year’s Science After Dark event for kids. But the Estuary Program doesn’t rely solely on volunteers and our dedicated staff. We also need our partners to achieve our goal of a clean and healthy bay. This year, our partners have helped us with a wide variety of important projects. The California State Parks docents, ECOSLO docents, State Parks staff, SWAP, Morro Coast Audubon Society, SLO Botanical Gardens, local educators, and others have helped us reach more than 11,000 children and community members at events, talks, and field trips throughout this year. The Morro Bay Harbor Department works tirelessly to support Morro Bay’s designation as a California Clean Marina, through oil recycling, maintaining pump-out facilities, and supporting boaters in using proper maintenance practices. 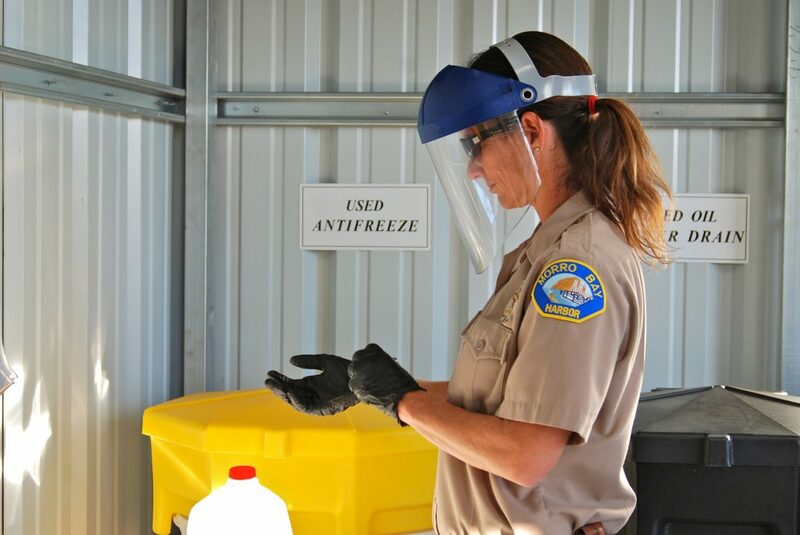 Becka Kelly, Harbor Department Supervisor, dons protective gear before pouring some oil into the drum to be recycled. The County of San Luis Obispo completed three different restoration projects in the Los Osos area that provide important native habitats to protected species. Coastal San Luis Resource Conservation District brought a group of local restoration partners together to begin planning a new wetland restoration project in Los Osos Valley. The Land Conservancy of San Luis Obispo County worked with private landowners to protect agricultural land and native habitats from future development. These are just a few examples of the hard work happening around our watershed to protect clean water and healthy habitats by committed partner organizations, individual landowners, and citizens. I am so proud to be a part of this community and I hope you are, too. 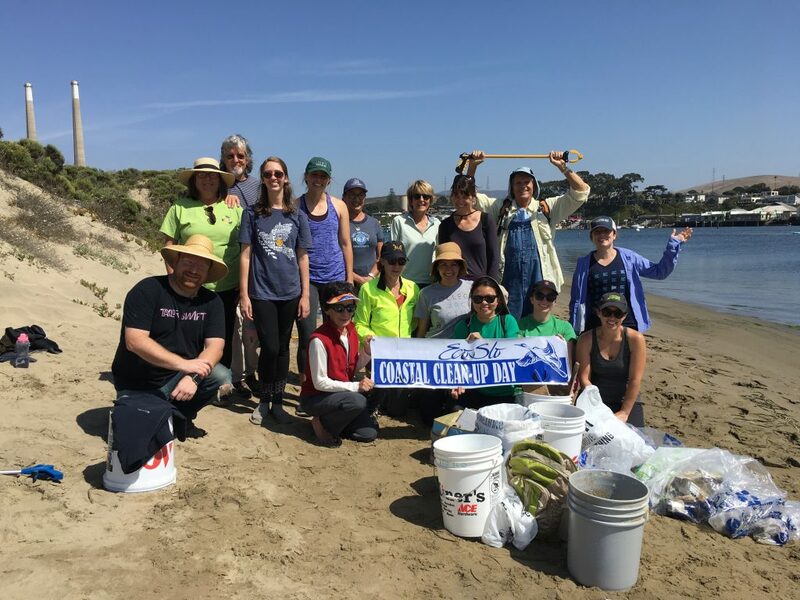 Whether you support these efforts through volunteering, or remembering to conserve water at home, informing yourself about the issues affecting Morro Bay, or donating to help with our work in the watershed, you are a part of the legacy and the future of the Morro Bay estuary. Subscribe to our weekly blog to have stories like these delivered to your inbox each week. In January, we’ll post a blog series about our accomplishments in 2017. Donate to the Estuary Program to support our work in the field, the lab, and beyond. You can also support us by purchasing estuary-themed gear from ESTERO or from our Estuary Program store! © Morro Bay National Estuary Program, All Rights Reserved.